Here at Mountain Kingdoms, we love an adventure! We have a passion for exploring fascinating destinations that are a world away from modern civilisation, and we know just the way to do it! From experience, we feel that you don't quite get to fully appreciate the stunning sights before your eyes when you arrive amongst dozens of other coaches and masses of tourists, as your experience is polluted with noise and crowds. This is why we’ve carefully devised our outstanding Dana Trek to Petra. 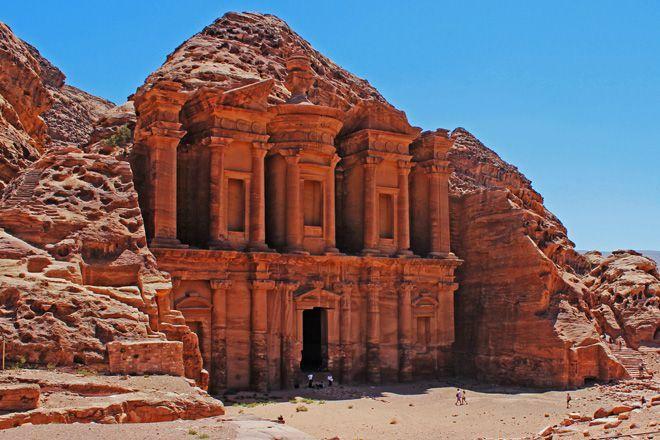 The ancient City of Petra, the Rose-Red City is well-known for its fascinating temples, dwellings and tombs skilfully carved into the sandstone of twisting narrow rock gorges. The city was only discovered by Westerners just over 200 years ago, and today is Jordan’s most valuable treasure and greatest tourist attraction. This desert and mountain trekking holiday has been designed to avoid the overcrowded tourist trails and excessively long treks typically used by other companies. Instead, unlike usual routes, we descend on Petra City from above to follow the valley floor to arrive early at another entrance, avoiding the crowds to allow you to experience Petra to its fullest potential in peace and quiet. This 11 day trip is a moderate trek, walking through deserts and rugged mountains. We first reach the ancient trading stop at Little Petra and then, finally, the ancient city of Petra itself. There are two days to explore Petra’s famous highlights, including The Monastery and a walk through the twisting narrow siq (gorge) to reveal The Treasury, a stunning 43m high façade carved in the early 1st century. Whilst the sandstone carvings of temples and tombs are an amazing sight, trekking through the siq with 80m high cliffs towering above you is an experience itself. Throughout the trip, travellers are accommodated in first rate camping set ups and good quality hotels/lodges. If you’re feeling inspired and wish to know more about our trips to the Rose-Red city of Petra, check out more information online which gives a more detailed day-by-day itinerary as this trip consists of so many more cultural experiences than just Petra itself.